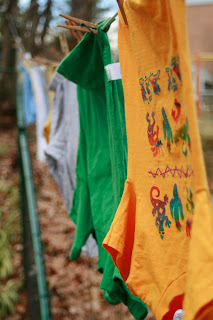 In our continued effort to be more "green" and to save money, my husband and I constructed a clothesline for our backyard. We have it on a pulley system so that I can stand in one spot and hang the clothes out. One of the things that I'll have to get use to is basically doing a load of laundry a day. So that each load has enough time to dry on the line. It sounds daunting to me right now but I'm sure overtime it will become part of the daily routine. At my old house, I only had a washer and not a dryer. It was great for the Pittsburgh summers, but in winter clothes would be hanging all over the house! The convenience of a dryer is nice, but my clothes lasted so much longer (i.e. no shrinking!) when I was doing the hang dry. Right now if we hung our clothes outside they would turn to ice!